Discursos apologeticos, en que se defiende la ingenvidad del arte de la pintura; que es liberal, de todos derechos, no inferior a las sie te que comunmente te se reciben. Madrid, Luis Sanchez, 1626. 4to. With an engraved architectural title-page by Juan Schorquens. Early 19th-century Spanish gold-tooled, sheepskin (root or maroquin pattern). 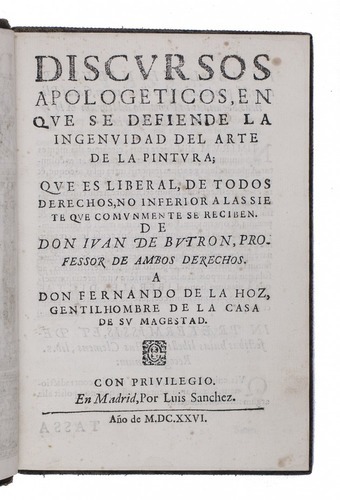 First edition, in the original Spanish, of an important treatise on the value and quality of the art of painting, containing many interesting observations and remarks on the fine arts and its relation to other liberal arts, such as dialectics, rhetoric and arithmetic, presented in 14 discourses. Juan Alonso de Butron, a jurist born in Najera dedicated his work to his mentor Don Fernando de la Hoz, "Gentilhombre de la Casa de su Magestad", dated 1 October 1626. After the dedication, prologue, a laudatory poem by Joseph de Valdivielso, a list of the authors mentioned, a summary of the discourses and other preliminaries, the main text occupies 123 pages followed by an index of 36 pp. The beautiful frontispiece was engraved by Jan Schorkens (1595-1630? 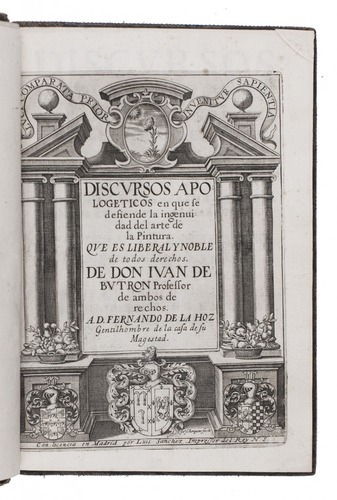 ), a Dutch engraver who travelled to Madrid around 1618 to work mainly for the printers and publishers there and remained apparently to his death. With occasional contemporary manuscript notes and some underlining, and two bookplates on paste-down. With occasional minor and mostly marginal foxing and 3 of the last 4 quires slightly browned, but still in very good condition. 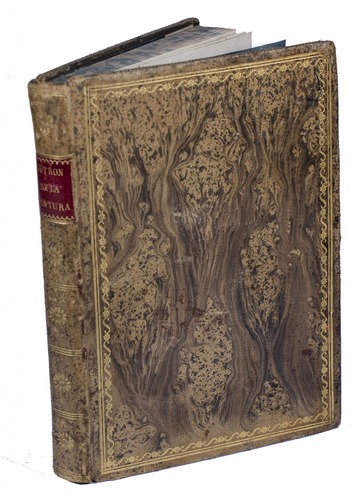 The charming binding (from the revived golden age of the Spanish book arts) is slightly worn around the extremities and has a couple small scuff marks on the front board, but is also very good. A lovely copy of an interesting work. Goldsmith BMC STC Spanish, B349; Palau 38161.